Over the next two weeks students enrolled in CEE (Civil and Environmental Engineering) 449 at the University of Illinois are taking a field trip. You won’t find them heading to Springfield or Washington, but in an effort to find solutions to the developing world’s water and sanitation problems, they are heading halfway across the globe to Kenya and Uganda. Globally about 748 million people drink water that is likely contaminated. Of those, about 90 percent reside in rural areas and 43 percent on the continent of Africa. In addition, a whopping 2.5 billion people worldwide lack proper sanitation. The class, under the umbrella of the Safe Global Water Institute (SGWI), will see firsthand the challenges residents in rural villages in Uganda and Kenya face in getting safe drinking water. The students will work the rest of the semester on solutions to address those problems. It’s the goal of the SGWI, which resides on the U of I campus under the leadership of CEE professor Benito Marinas, to use a multidisciplinary, multi-institutional approach to address the problem of safe water and sanitation in places where people don’t normally have access to solutions to these serious problems. The CEE 449 class gives undergraduate students an opportunity to influence the process. The class itself will be divided in four design teams of graduate and undergraduate students with separate emphases on water and health, sanitation and energy, and renewable energy, although the solutions will be integrated. 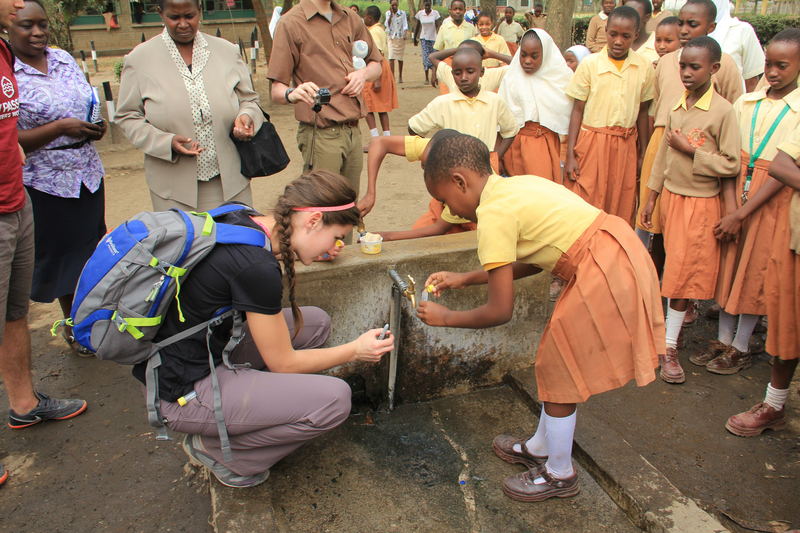 Students from the University of Illinois are making a difference in helping bring safe drinking water to citizens in East African nations. Of the 36 members of the CEE 449 class, 12 will be a part of either the trip to Kenya (Feb. 6-13) or Uganda (Feb. 13-22). They will, among other things, explore issues with fluorosis (too much fluoride in the water) and incorporate anaerobic digestion (turning human and animal waste into valuable energy and fertilizer). They will then report to those back on campus the problems they have diagnosed and use the rest of the semester to develop a solution. SGWI will then work with partners to help implement those ideas. Several members of the permanent on-campus team took CEE 449 as undergraduates and were motivated to continue the work of the Center. The first three weeks of the class are taken at an intense pace in preparation for the international trip. Marinas and the SGWI (formerly WaterCAMPWS, a National Science Foundation Science and Technology Center), have developed a global consortium of partners and researchers, educational institutions, local stakeholders, governmental officials, municipalities and non-governmental organizations (NGOs) in the targeting East African countries to develop real solutions. They have also mobilized key people at the University of Nairobi in Kenya, Makerere University in Uganda, and others on the U of I campus (Molecular and Cellular Biology Professor Joanna Shisler, CEE Professor Jeremy Guest, Business Administration Professor Madhu Viswanathan, and Chemistry Professor Yi Lu) who offer expertise in microbiology, engineering, business, chemistry, and sociology to help with the effort. “We are working with local entrepreneurs to develop some economic incentives for residents to follow our recommendations,” added fellow graduate assistant Bernardo Vazquez Bravo. While the initial focus of the institute was on providing safe water, last year they added a focus on sanitation and this year renewable energy, which has helped expand the involvement to professors in the Department of Mechanical Science and Engineering. For instance, in striving to use the energies available (directly or converting to electricity), MechSE professors Leonardo Chamorro and Elif Ertekin have lectured on their expertise in wind and solar energies, respectively. The Center is working towards starting the implementation process in these areas. The additional emphases also align with the worlds’ Grand Challenges of Engineering as articulated by the National Academy of Engineering.